I am new to opencart and trying to create custom theme using verson 3.All the tutorial i found on internet are for v2 and not working properly with v3. Please guide me. 2. Create the files by copying the default theme files i.e. 3. You can now go to Extensions- Extensions Filter Themes and see your new Theme. Enable, choose the directory you uploaded at in step 1 and set all the parameters necessary and save. 4. You can now go to System Settings edit your store(s) and select the NEWTHEME. You should now be seeing your new theme (assuming client/server caches are set to renew). 5. Now you can create your themeby changing css or template files or any other file to suite your need . # there are 48 occurrences  in this template. # in this file. I will leave alone for now and if it doesn't work i'll come back to this. You can now go to Extensions- Extensions Filter Themes and see your new Theme. Enable, choose the directory you uploaded at in step 1 and set all the parameters necessary and save. Ok, I see my theme in Extensions > Extensions > Filter=themes but when I try to enable it I get "internal server error"
I need to find out how to get better errors and turn on debuging / find where the logs are stored. I'll be back once I get that figured out... I'll also try changing those 48 occurrences of default_theme_* to MyTheme_* and get back to you. In my case, that entailed changing the name ControllerExtensionThemeDefault to ControllerExtensionThemeBamidbar fixed the problem; bamidbar is my theme's name. There was a question from a commenter about which items needed to be renamed to theme_THEMENAME - I did a global search/replace of all occurrences of theme_default in the three files in the admin/ directory. That seems to have worked. After looking into these posts, I thought this had solved my issue and it now appears in my store to select the template, but when I go to extensions>extensions and select the template and update the fields I get this appear at the top of the page. Does anyone know why this is happening and how it can be fixed so that it saves what I'm inputting. Hey guys im having this same issue tho. Notice: Undefined index: theme_fantasy_product_limit in...... working on it for 2 days now anyone know the solution ? 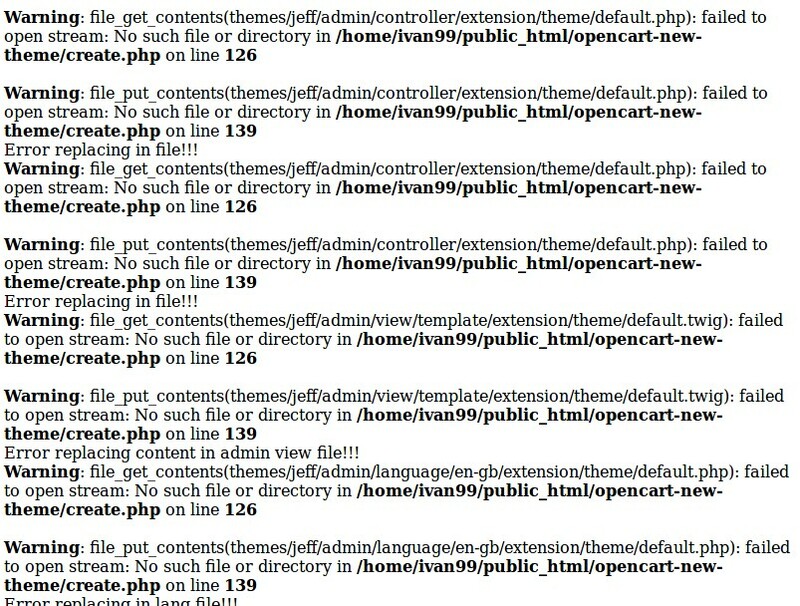 I try to do custom theme in opencart, I have seen some tutorial in that they coping the default theme and renaming some file and title, They showed this directory (/admin/language/en-gb/extension/theme/default.php, ./admin/view/template/extension/theme/default.twig, ./admin/controller/extension/theme/default.php) but in my opencart root folder there is no such folder in my root directory. How to get the files. I had same problem with undefined index with new theme inputs name, It's solved when I disabled caching. There is a a gear on the admin dashboard. Click the gear and you get options to disable caching. I've been having the undefined index errors which has been resolved by replacing all instances of "default" in admin/view/template/extension/theme/my_theme.twig with "my_theme" (obviously it should be whatever you've used for your theme name). Looking further into the file all the input box names are theme_default_blah_blah_blah so it makes to change them all to whatever your theme name is. It's worth mentioning that I did turn off caching first. first post of that topic and previous post (by kevxcs » Wed May 23, 2018 2:36 pm) made it complete for me, just as covered by the following video https://www.youtube.com/watch?v=mqTstomXZiM. This video tutorial is almost 100% step by step but you might have to use common sense sometime as for example the "admin/view/template/extension/theme/MYTHEME.twig" file changes, line 128. I changed 'default' to 'MYTHEME' and everything works fine so far. I've created simple web app for creating new custom Opencart 3.x.x. theme. Please test it and let me know result. Last edited by AndreyK on Sat Feb 23, 2019 1:00 pm, edited 1 time in total. And only copy necessary files (CSS, images) and modified templates to the new theme folder. "Creating a new theme for OpenCart 1.5 used to be pretty easy - make a folder in the theme directory and copy only the files from the default theme that you want to change. And that was about it. OpenCart 3 brings new features, but creating a theme is a little more difficult." Presumably you haven't created an OC3 theme yet. I have created a number of OpenCart 3.x themes for various sites. I just tested it again, it works fine! What exact version of 3? Pretty sure a new theme needs "VC-L" - View, Controller and Language (but not Model) in the admin to appear in the dropdown. I could be missing something obvious - would be good to get to the bottom of this.